112 more cards for the game of killing monsters and taking their stuff. Play a new race: Orcs! Face foes like the Hydrant and the Tentacle Demon. Equip yourself with dread armor like the Spiked Codpiece. Recruit allies like the Shoulder Dragon. Wield mighty weapons like Druid Fluid, the Slug Thrower and, of course, the terrifying Unnatural Axe... and show them who's the greatest munchkin of all. 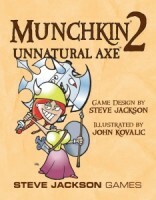 Munchkin 2: Unnatural Axe is a supplement to Munchkin; you will need the original game to play. Or you could add it to any of the other Munchkin game sets instead. It'll work, and it'll be silly, and that's what we all want here. 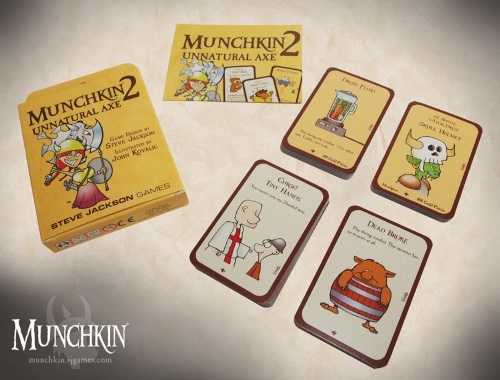 Add a Review for "Munchkin 2: Unnatural Axe"